A selection of piano pieces, little known until now, from the classical and pre-classical era. 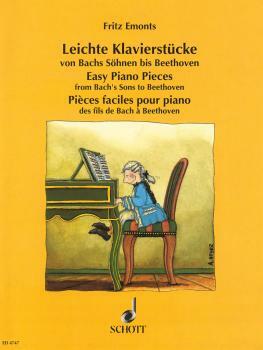 The level of difficulty is comparable with the demands of the easy sonatinas by Clementi and Kuhlau. There is an emphasis on lively dance forms rather than on rococo-like “affection-pieces.” These vivacious and varied pieces offer a playful introduction to the works of the Viennese Classics. Contents: Allegro (C.P.E. Bach) • Larghetto (J.C.F. Bach) • Two Minuets (J. C. F. Bach) • Minuet (W.F. Bach) • Bagatelle (Beethoven) • German Dance (Beethoven) • Tanz (J.F. Christmann) • Valse (Clementi) • Allegretto (Diabelli) • Andante (Diabelli) • Allegro (Galuppi) • Allegro (Hässler) • Andante (Haydn) • Arietta (Haydn) • Menuett (Haydn) • Rondo (Hook) • Ecossaise (Hummel) • Rondo (anon) • Menuett (Kirnberger) • Two Minuets (L. Mozart) • Allegro (W.A. Mozart) • Siciliano (Müller) • Menuett (Nichelmann) • Allegro all'inglese (Reichardt) • Menuett (Sperontes).